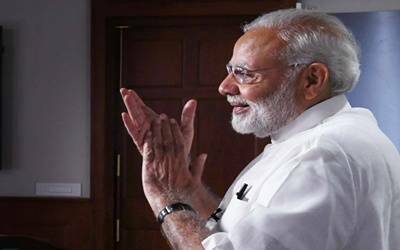 New Delhi, Sep 15 (IANS) The 15th Pravasi Bharatiya Divas (PBD), the External Affairs Ministry-organised conclave of the Indian diaspora, to be held in Varanasi from January 21 to 23, 2019, will be a bigger affair than all the past editions with a couple more programmes being added, it was announced on Saturday. Speaking at the launch of the official website for the event here, External Affairs Minister Sushma Swaraj said that in addition to attending the three-day PBD in Varanasi, the participants will also be taken to Allahabad where the Kumbh Mela will be going on then and then brought to New Delhi for the Republic Day celebrations. Giving details of the programme, Sushma Swaraj said that on January 21, a Youth PBD will be held where Himanshu Gulati, an Indian-origin member of parliament of Norway will be the chief guest and Kanwaleet Singh Bakshi, also an Indian-origin member of parliament of New Zealand will be the guest of honour. On January 22, Prime Minister Narendra Modi will inaugurate the main event with Prime Minister of Mauritius Pravind Jugnauth, who is also of Indian-origin, attending as the chief guest. The event will conclude on January 23 with a valedictory session that will be addressed by President Ram Nath Kovind. During the session, the Pravasi Bharatiya Samman will be conferred on 30 Indian-origin individuals for their exceptional and meritorious contributions in their chosen fields or professions. "On January 24, we will take the participants to Prayagraj (as Allahabad is also known) for the Kumbh Mela, which has been inscribed on the Unesco’s Representative List of Intangible Cultural Heritage of Humanity," Sushma Swaraj said. Following this, the participants will be brought to New Delhi by special trains to take part in the Republic Day celebrations on January 26. After being an annual event for 13 consecutive years starting in 2003 at the initiative of then Prime Minister Atal Bihari Vajpayee, PBD was turned into a biannual affair after the 2015 edition in Gandhinagar. After the 2017 edition held in Bengaluru, the External Affairs Ministry has now roped in Uttar Pradesh as the partner state with Varanasi as the host city. Giving the rationale behind turning PBD into a biannual affair, Sushma Swaraj said that after the 2015 edition, she realised that PBD was not yielding much in terms of results as an annual affair. "So, I suggested to the Prime Minister that it should be held every two years with the intervening year being used to hold meetings with groups of diaspora members on various issues and he agreed," she said. Though the earlier editions were three-day affairs ending on January 9, the day Mahatma Gandhi returned from South Africa, on January 9, 2019, PBD will be observed in Indian missions across the world. With the launch of the website, registration for PBD 2019 has started effective from September 15 and will continue till November 15 when the process will close. Speaking on the occasion, Minister of State for External Affairs V.K. Singh said that more participation is expected in the Varanasi event than the last one in Bengaluru. Uttar Pradesh Chief Minister Yogi Adityanath, who was also present, recalled his participation in the mini PBD held in Mauritius in 2012 and said that with the 2019 PBD being held in Varanasi, many participants will be able to trace their roots back in India. Many of the people of Indian origin in Mauritius are descendants of people taken from eastern Uttar Pradesh and Bihar during the time of the British Raj to work as indentured labour on the sugarcane plantations on the Indian Ocean island nation.